E Pluribus Unum. 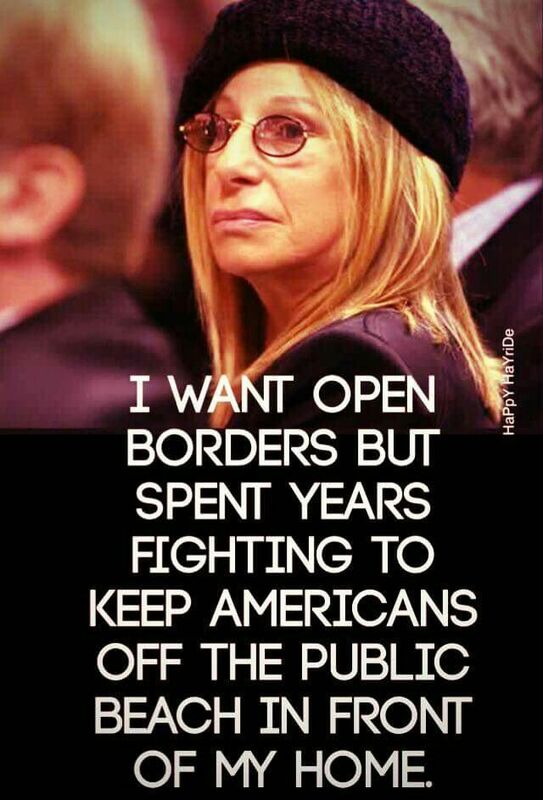 Out of SO many hypocrites, one especially silly, delusional Dame of the Double Standard. Be sure to enjoy Babs’ stirring new album, entitled (what else!?) WALLS. It’s hardly news that the rich and powerful among the Barack/Hillary crowd are all for Open Borders because illegal, uncontrolled immigration and amnestied naturalization means millions of new government dependents: A permanent underclass! A permanent Democrat voting majority! These same people are aghast at the idea of responsible, individual Americans possessing firearms to defend themselves while themselves enjoying whole armed details and all the self-defense and protection AND WALLS money can buy. Again [deep weary sigh], the word “hypocrisy” seems to carry no power to shame, embarrass or give any pause to those people on the TrumpLoathing Left who consider themselves above and exempt from the usual life rules governing the rest of us. Remember these are people who think nothing of robbing other people of their money, property, basic rights via high taxation and crippling regulation while expecting to enjoy their own private property/ownership rights undisturbed behind high WALLS. Does this not rankle what little remains of honesty among Nancy Pelosi’s Trump-Hating Basket of Adorables? The answer is No. Being Progressive/Anti-Capitalist/Marxist/ is their 10 Commandments, their moral code, their sense of right and wrong, the bedrock of their perceived World Order. All in disagreement are Hitler and Nazis and bad stuff like that. The good news is that we Fascist Deplorables have been gifted the unique figure of a Donald Trump able to draw out the innumerable little lies of The Big Lefty Lie; so let’s enjoy the show, starting with this business of WALLS, “immoral” for us Little People, fully justified for them. After all, they are Socialism’s Superiors, and we are but serfs. What value could our lives have compared to theirs?